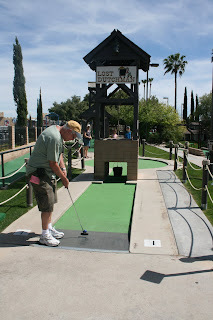 The Gray's Wild Adventures: Day 15 - Golfland. We even managed to sneak in a little shopping! We enjoyed a french toast breakfast (thank-you Daddy! ), packed up our lunch and drove into Phoenix. It was hot & and lovely! 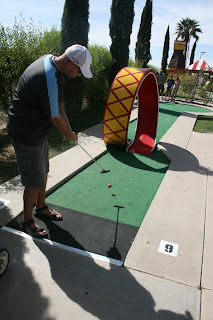 We went to a few box stores first as golfing didn’t open until noon. The girls wandered through a few favorites while the boys checked out the auto center. We had a “tail-gate” lunch before heading into the castle. It was very busy (Spring Break for the AZ kids) so we sent the guys in to get the tickets while us girls (and Matthew) sat in the shade. We teed off on the “Lost Dutchman” course and enjoyed an afternoon of laughs & multiple putting strokes! I think Daddy was the winner with Joshua & Grandpa tying for second. It was lots of fun and Matthew enjoyed watching all the golfers along the way. After our game of golf we crossed the street and checked out the go-cart races. David, Joshua, Megan & Grandpa all hit the track and raced! It was fun to watch them go & they all had fun too. Everyone was feeling pretty hot, so we loaded up and found some slurpees, thank-you Circle K, and iced coffees before making our way home. We found a Hobby Lobby on the way home and the men were gracious (again) to let us stop and enjoy a final shop at the greatest craft store EVER! ☺ We picked up some material (Megan has some new sewing projects awaiting her) and a few scrapbooking goodies (Happy Birthday to me from Mom & Dad Gray!!). We enjoyed delicious leftovers from Jim’s Indonesian dinner last night and then the kids played Dutch Blitz until bedtime. Sarah hung out at the climbing park until we had our golfing tickets. First putt of the day. munch, munch.... still no teeth. Joshua thought this rollercoaster loop was cool. 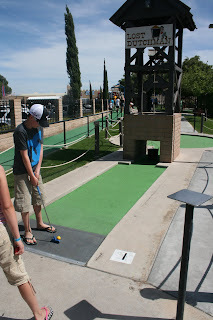 A fun day at Golfland. Day 12 - Relax & soak up the sun! Day 4 - Anaheim Garden Walk... and sniffles.